PRINT THESE PAGES- Then you need not come here every time. The PEAC System evaluation results may seem complex, and it is true that there are several dynamics that are revealed in each report. In an effort to help make the PEAC evaluation a little clearer, many of these basics are spelled out herein. Studying these for the first several evaluations can save you time by shortening your review with a Reader. The Norm Line, marked so at the foot of the center double vertical line in the top chart, is like any other evaluation for marking the center of the statistical population. Bars that end to the left of that line indicate a lesser trait than the average person. Traits ending to the right indicate more than the center of the population. The second purpose for the centerline is labeled, again at the bottom of that vertical line, ERL, or Energy Reserve Line. This indicates an available energy to make changes in one's profile to adapt to a contact, prospect or client. This applies as well, in-house, with employees and supervisors. Below 45 is more of a problem in high interaction positions. A 30 is pretty much what you see is what you get, while 47-55 is much more adaptable. Above 56, however, is excess energy and moves into the visible realm, which may indicate a scattered, unfocused side, especially into the 58-62 range. Psychologists consistently rate this upper level as ADHD territory, undiagnosed herein, but something to be aware of when considering a hire. Scattered style profiles are inconsistent and very often difficult to manage. The report that you must pull up, every time, the Basic Self Report, at the bottom of the physical chart, along with a clean copy of the graph, are printed and kept on file for one year. Printing is a requirement in case the individual seeks their own copy of the results. These copies cannot be computer generated at the time of the request. These are shallow enough to avoid offending the evaluatee, but are satisfying the EEOC requirement to have available for that request. It is their right, and you need not discuss any part of it. Do NOT include this page. On the Basic Self Report is a link to further instructions which will lay out the individual definitions and more. Print a copy and keep it with these pages. You need not print any of the instructions or these pages more than once, if you keep them at hand. Again, none of the instruction or these helper pages are to go to the evaluatee. It is also important that your decision to interview, hire or such, is not based solely on an evaluation. This PEAC evaluation is but 25% of the entire process. Making a decision solely based on a test of anything other than a skills test is illegal in EEOC mandates. If you turn away from a candidate, it is because you are 'processing others and you will call them if you need to return to them.' It is never 'because' of any kind of style or intelligence evaluation. The most important aspects are in plain view and become basics within a few reads. You can reason them out here. Right above the graph, at the center, you should see the words Profile and Stress. In each case, the letters that follow simply lay out the chart below the words, left to right in order of their right end on the graph. The numbers that follow Profile and Stress can be extremely important, depending on the position or responsibility that you are evaluating the individual against. Here, the information is dynamic and should require a Reader to walk you through the first several times. These numbers are zones, with those to the left of the 0, or Norm Line, are negative, and those above are positive. Suffice it to say that anything above zone 4 or below zone -4, is usually a strong indicator that change to lessen or control it will be difficult on you and on your evaluatee. You can simply put those respective numbers, +/- at the end of the bars to understand the zones. The PEAC System evaluation is tailored around trait pairs. The top two, Power and Extroversion are Influencers, how the individual interacts with other people. It is a matter or persuasion, control, poise, or in the event of high Extroversion alone, hope. The next two, Analysis and Conformance are Parameters, or the traits that control the two above. Thus there are many shades of those Influencers, from wild and free (and hard to manage), to subdued, even repressed, and helpful only in the right positions. You can draw a bracket to encompass each pair on the far left and label them until you are familiar with this concept. This Basic Self (shown by the dark bars) is pretty much in place from early childhood, and it is not easily changed to something else. Intensities, the distance from the Norm Line can vary depending on health, sobriety, drug use and such, but the Basic Self will seldom change the general shape of the profile pattern by much. It is true however, in our over thirty five years of evaluations, that we see a slide toward the position from the basic self over a long period of time. It is a form of therapy, where the constant application of style required forces the individual to adopt a different basic profile that may be midway between his or her position requirements and their own basic self. But that requires many years, and is not valuable if you expect faster results. Sometimes, the individual will blow off the evaluation, altogether, or leave enough questions that it is tempting to have them try again. There is a warning, however. Asking an individual to retake the evaluation will almost always cause them to play with it, trying to come up with a better profile. We do not run additional evalutaions for no cost, and it is our recommendation that you do not do this, even a few years into employment with you. The first evaluation is the most important, and best trusted, assuming you administered it properly. More on this below. As a broad brush indicator, there are two basic styles. Critical to most give and take, people oriented positions are the Extroversion and Power to the right. To provide the drive necessary to make this profile successful in sales, persuasion and the like, the Analysis and Conformance should be to the left. See the left graph, above. If all of the dark bars lie (end) on that 1 to 7 line on our clock, they are just about ideal for all give and take, sales, consulting, and so on. They are not wind-up toys, for they still need training, but they take to it much more easily that the other basic, systems oriented people. If only one is to the right, as in Power, especially with lower Analysis and Conformance, they can close hard, show strong control tendencies and such, and are harder to handle from a management standpoint. On the other hand, if it is Extroversion by itself, they come across correspondingly higher people oriented, talkative, friendly, even, then, if over zone 4, insecure, especially without Power to the right to help. They might not close or ask for the business. They may talk too much. Usually found in product sales, rather than services. Training can help, but the farther off the traits are, the more difficult it is to bring them to the performance you seek. The other basic style has low Power and Extroversion, on the negative side, with high Analysis and Conformance to the right, and are systems oriented. See the graph above on the right. They prefer working without the give and take of people they do not know. They can make good friends, but limit the number to those they most trust. If you put them in an environment where they believe they must 'pester' people, turnover is too often the result. This is partly because, as systems people, they, too, do not like being 'pestered.' But, in addition, they are not comfortable in the give and take of cold calls or discussions that require quicker thinking. In system or function, they do it well, take thier time, and have pride in their work... usually. Intelligence plays a factor here, too, and the PEAC evaluation does not measure that category. Of course, if you are unsure, a discussion with a Reader can make all the difference. The higher the zone numbers, of course, the more intense these traits and the styles become. If the entire profile is closer to the Norm Line, as in a very narrow profile (all zone 1), many can adjust, especially with ERL above 50, but it is always more effective to start out with the what your requirements are for the proper 'people vs. systems' orientation. One more consideration, graph three to the right, before we leave this theme. If Power or Extroversion are on the center line, the Norm Line, then that particular trait is identified as 'tolerant'. This means the Extroversion allows easy interaction, but the 'need' for people around the individual is not critical. Sometimes this can be handy where interaction is not all that heavy. Centrally located Power means that the profile is tolerant of the leadership of others, and yet has the ability to push it right as needed, for that person understand the concept of control, without living it every moment as say, a high Power individual might do. Of course, the concept of pushing the traits to the right is enhanced by a moderate to higher level ERL. 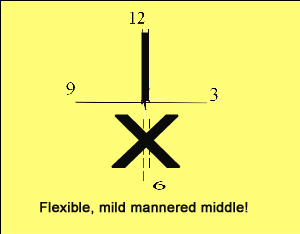 The 'X' on the bottom means that either Analysis or Conformance can lead or follow, as long as they are opposite one another to balance the profile. There are a couple of special patterns that are readily identifiable, and measured not only in the PEAC evaluation, but proven in other studies. One is the Counselor, the combination of low Power, high Extroversion and high Analysis. Friendly, likeable, but slower, more careful to learn and to handle the give and take of sales and the like. This is a matter of a deep need to understand all situations, a trait of high Analysis people, sometimes to the point of 'Analysis Paralysis.' Replacing high Analysis with high Conformance can simply make them do everything by the numbers, often very civilized and polite, doing only what they know, or have been taught, and little else. Counselors are often found in HR positions, content to wait for a call than to have to make them without purpose, as a resume in hand. Returning calls, screening and such are their domain. Customer service applies, assuming the Extroversion is stronger than the Analysis by at least one zone or more. It is better to show the care, rather than just going through the motions. Selling is seldom the issue. Do not expect quick service, fast paced performance, and a willingness to make cold calls, if that is your requirement. The other special pattern is a low Power and higher Extroversion, especially when they are at least four zones apart, i.e. -2Power and +2Extroversion. This is an area identified by an evaluation solely focused on this in the early eighties, called 'Call Reluctance.' In spite of the evaluatee's claim to the contrary, they hate the phone, hate cold calls and are purely ambitious, rather than driven. Effort can fade quickly, all too often. This can hold true even if the Power is right, say +1P and the Extroversion is +5E or more. Still four zones apart. Keep in mind that volume outbound calling, as in call centers, is not a give and take environment and most profiles can do this, at least for a while. It seldom applies to the rest of the business world. Ambition is turned on, intellectually, and can easily be turned off, creating turnover. High Power profiles, with low Analysis and low Conformance are drivers, and this determination is more instinctive. Of course, too much driver, as in a wide profile above zone 4, are also much harder to control from a manager's perspective. It is our recommendation that you seek the balance of a midlevel profile. Our Reader can help with understanding this. The two patterns as they are described are along zone lines no wider than plus and minus 3. However, if the traits are more than a zone wider than these guidelines, as in 5 or more, then additional difficulties can ensue. In either case, 'systems' or 'people' oriented, much of the success of the individual rests with the manager and his or her own profile. A demanding, fast paced, 'my way or the highway' manager will need strong profiles to handle the constant heat. Wilting profiles will often wash out all too quickly. On the other hand, mild mannered, soft spoken manager should not take on very strong profiles without caution. Those styles can dismiss a soft manager and become very difficult to train and direct. Again, a Reader can help in this area. The Facade can change quickly, like clouds, daily, hourly, and so on, and is not useful in hiring, for the most part. It is unpredictable. It is in the realm of 'mood orientation,' for it can indicate how a person feels in their current or past position... which might be why he or she is looking to you. The differences, taking into consideration the energy level, are rated in Current Fit, discussed down below. An interesting aspect of 'mood orientaion' is that a very high percentage of evaluations on the market for the past few decades and today identify that mood as the style of the individual, proven time and time again against the PEAC evaluation, where the basic self is what you must train and manage. Mood styles are inconsistent, unpredictable and too changeable. Decisions are important in any give and take arena involving myriad contacts. Anywhere within the middle box, right above the dark bar, the easier it is for the individual to relate to people across the scale. Heavier logical people, fact oriented, have difficulty communicating properly with the 'feel good', emotional people and vice a versa. Current Fit, (CFIT) mentioned above, is a mild guideline to existing stress in a current or past position (their indicated Facade) against the individual's basic self. The indicators for a corresponding urgency to leave their current postion, which might be in your company, should you, like most managers, assess your own people, are a lower CFIT in the neighborhood of 20-30. The higher the number, the less the stress. Find the number by drawing a straight line downward off the right end of CFIT bar to the ruler below. Fifty and over is considered no stress and nothing is gained above that number. Forty to fifty is an ideal range for simply supplying enough challenge for most profiles. Energy Type is very critical in many arenas. There are two distinct classes of people that are extremely valuable to us all, yet have very different Energy Types. Look at the graph to find the AB marker under the last bar at the bottom of the graph. Those that have their Energy Type end inside the small space will show flashes of Type A, and occasionally, Type B. The realm of Type A people is often some form of give and take, sales, multitasking, interruptions, over-extension (taking on too much at once- failing to complete one task before changing direction, especially above 65-70) and so on. On the other hand, Type B is the realm of the single purpose functionary. Programmers, engineers, bookkeepers, accountants, and many of that kind of work. Clinical Type B shows below 30 on the ruler. The old saying, "There are no 'hurryup' bones in an engineer," applies directly at this level. Keep in mind that there are as many Clients who need Type B as there are those who seek Type A, and again, for very different purposes. Both are valuable in their own realms. This is one of the principal mismatch areas that create turnover. Half of that is the tendency for anyone with a Type B style to see all Type A as hyper and scattered, while the Type A sees the B as moving in molasses. True or not, it creates misunderstanding, frustration and... turnover. Now, let's consider one of the most imporant areas in determining the indvidual's buy-in to taking the assessment. Look below the graph about two inches. On the left, you will see Consistency Factors. This is akin to comparing the answers to Dominant and Yielding. You cannot be heavy in both (5), or very low in both (1). They are opposed and the answers should reflect it. Look to the end of the paragraph for the results of the evaluation. Anything 68-70 is negligible error. Above 70 is non existent error. Take this concept over six hundred word combinations and any attempt, instinctive or purposefully, to mask a trait will stand out with a low number in the traits at the end of the paragraph. P( ), E( ), A( ) and C( ) are simply the traits in the graph above. A 65 could be as much as an inch in error, either way, left or right. The difficulty is determining where in those two inches the trait might lie. This can usually be overcome with references and more careful interviewing, such as live role playing. A 60 is close to two inches. A 50 is three inches! Neither of the lower indicators is easily overcome without serious digging. As a caveat, if the above indicators are empty, you did not copy the entire code before requesting the profile. It leaves off this important facet. Your email should still contain the full code. Highlight it all and try again. Interestingly, with high Type A profiles, especially with very low Analysis, Conformance and correspondingly high Power, the consistency factors hover around seventy, simply from taking the evaluation too quickly... or not paying attention. Any indicator less than 60, especially with more than one trait out of place, is considered blowing off the evaluation and your instructions. Even two at 65 can destroy the ability to interpret the evaluation. Those instructions are important. See the 'Mgr Guides' on our homepage, then click Administration for the proper approach to onboard or candidate personnel. As a recap, here, essentially, you are holding out the carrot: "Should we bring you onboard, we want to make you as successful as possible." Then the explanation: "To do this, we will try to train and manage to your profile." Then, the close: "Fill out the profile online. I will send you the required information for the evaluation. What is your email address?" Nothing more. All you provide with additional information is an indicator on how to defeat the evaluation. If someone else is assigned this administration duty, be certain that they send out the proper information in that email. You can find this information in the boxes on the evaluation online, at peacsystem.com ... then, to the evaluation and so on. Similarly, all of our clients eventually wish to evaluate current staff. The main change is the carrot: "I am sure you want us to help make you as successful as possible." Then the explanation: "To do this, we will try to train and manage to your profile." Put them online to take the evaluation. Do NOT evaluate current staff to set a benchmark. It is illegal. EEOC requires 2,000 units to verify a particular profile as successful. We have over 300,000, with far more than the limits in each arena to indicate the more likely successful profiles. One last bit of critical information will help you determine if the profile should fit the individual. On rare occasion, especially with High Type A styles, the individual will take the evaluation backward, ie, one is most like and five is least like. Look under the graph, left side, for the labels, Private Self and Public Self. To the right, find BnS, which means 'bright' and 'smart'. Below are the answers to those two words, Almost anyone will indicate a four or a five as reasonably bright or very smart. Only a few choose three's (or of average intelligence). This is, of course, their opinion and does not indicate how smart they really are. We have an evaluation for that called Reasoning Aptitude© that sisters with the PEAC evaluation if requested. Please understand that a very high Analysis profile can be very 'intelligent'. Think psychologists and engineers, scientists, and so on. 'Bright', however, requires low Analysis to use that intelligence at speed. If your position requires quick thinkers, higher Analysis will often prevent it and limit success in a give and take arena. By the way, so will impulsive, impatient low Analysis types below zone -3 who can be abrupt, pushy and over the top closers. A one or a two in either position, as in 12 or 23 or such, less than 33, may indicate they actually took it backwards and it is thus invalid. It may also indicate a difficulty with the vocabulary or the English language. Usually, this shows up when the report and the interview of the individual do not come close to one another. But keep in mind, the PEAC is designed to get around that front. Further interview, references and such will identify the basic self we provide as a match, almost every time. Again, with any reasonable intelligence, almost all people have no problem with the evalulation. Be certain that they use a Windows environment on a desktop or notebook, avoiding all Apple and mobile devices. That warning is spelled out on the front homepage. Failure to follow instructions, or an unwillingess to listen to you is probably indicators of pending problems in your hire, training or management. So, with this in hand, plus your reports and graph, if these still generate questions, you will need to set an appointment with a Reader. Call our office at (813) 634-5404, or email us at peacnet@peacsystem.com for assistance.